Happy Sunday evening. How was your weekend? Not long enough, I'm sure. :) My weekend was nice with weather being a combination of sunny times, rainy and wind, and then sunny again. I know this is not typical for most of you and if you are amongst the peeps suffering through a hard winter right now, I'm sorry. 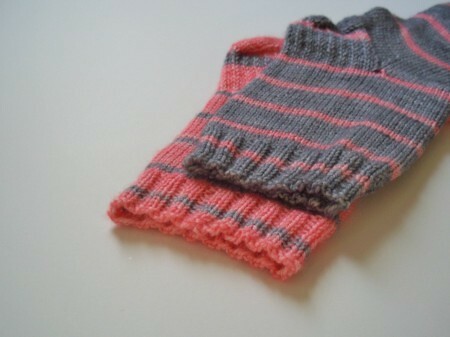 Now that I have finished my latest sample knit, I was able to delve into some selfish sock knitting. Previously I had mentioned starting the Forever and Always socks by Danielle Jorge in a different yarn, but I changed my mind. I started these socks last night and haven't been able to put them down. That chunky little cable has my heart. It is allowing me to knit in a bit of a meditative state of bliss. On the subject of meditating, I have a question for you all. I was watching a podcast where the host was talking about some really stressful times she has been going through and how knitting was hard for her because it made her think or dwell more on these worries. 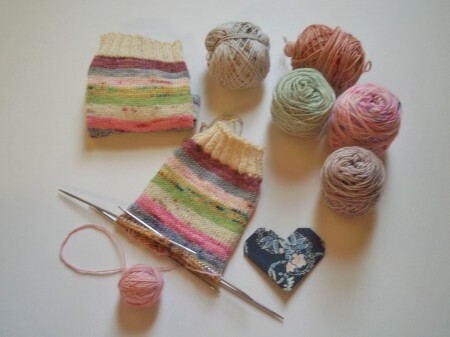 For me when I am stressed or worried knitting helps me clear my mind and sort of meditate. 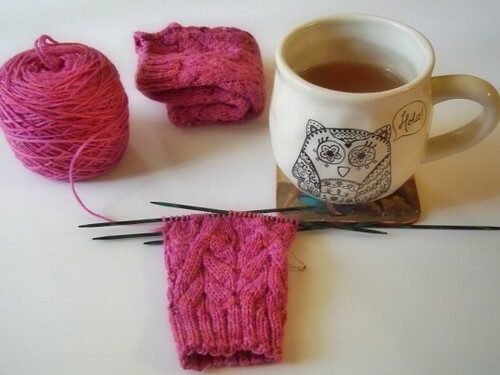 But the podcast made me wonder, when you are stressed or worried is knitting more of a hindrance or a solace for you? On a different note, I have gone through my sock WIPs and these are a few of the survivors of the "To Frog or not" mission I was on. 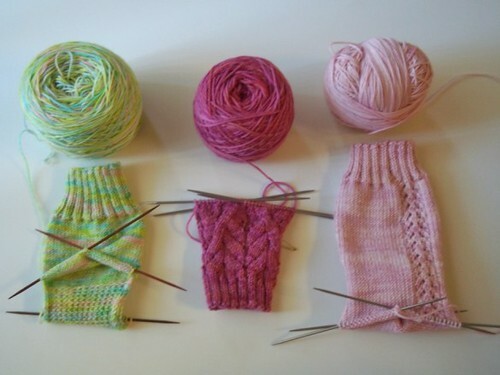 That means I really need to put aside the pink cabled socks and get to finishing these right? Enjoy a song and have the best day today! I am back, a day later than promise...but some days are just like that. :) I have missed you loads. Thank you for being so understanding about my time away. I know that it did me a world of good and it feels like my words have come back. How have you been? Knitting has been happening while I was away. Mostly sample knits for the talented designer Anne Podlesak. I was so excited to be able to show you the above sample knit! This gorgeous pullover is named Spring Frost and what a joy it was to knit. 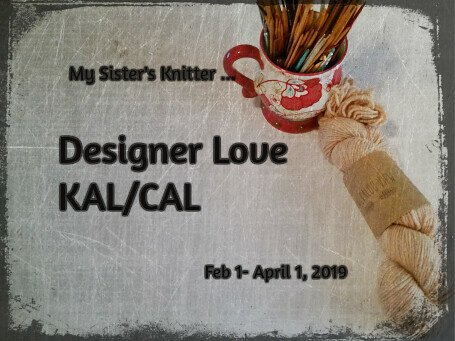 A new KAL/CAL has started in the My Sister's Knitter Group. 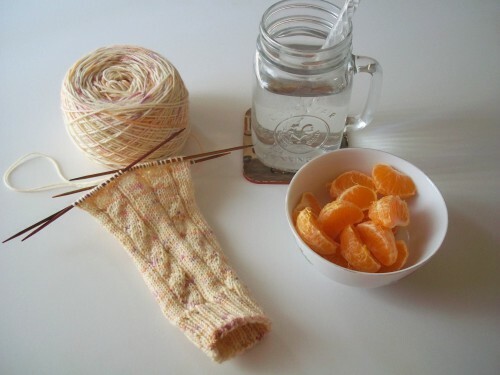 If you know me, you know I am thinking about knitting up some socks. With so many wonderful and talented designers it is rather hard to focus on just one, but I think I have narrowed it down. When I decide I will let you know. I currently have another stranded color-work knit on the needles for Anne Podlesak which is requiring much of my attention at the moment, but once it is off the needles I will get to my KAL knitting. Oh and I almost forgot, I completed a color-work sample hat...but only got the progress pic. For now I will leave you with a song and wish you the very best day. Thank you again for being so kind about my time away. Another weekend arrived and I was so ready for it. How about you? Maybe it is because my knitting has increased, but this weekend was welcomed with open arms. I guess that is what happens when you make a conscience decision to include it in your everyday. Since I made my temporary move in with my family of non-yarnies, it has been a bit of trial and error fitting knitting into this life. In addition I am in introvert and adapting that to living with others has caused my spirit to jolt around. Today I am letting those around me know that it will be a recharging day for me and I am going to knit till the cows come home. The key for me it to remember to let people know when it gets too "peopley". Helping me on the "all I want to do is knit" journey are two beautiful skeins of sock yarn that have made their way into my life. Above is Lamby Toes Moon Pie Merino in the colorway Experiment 098. 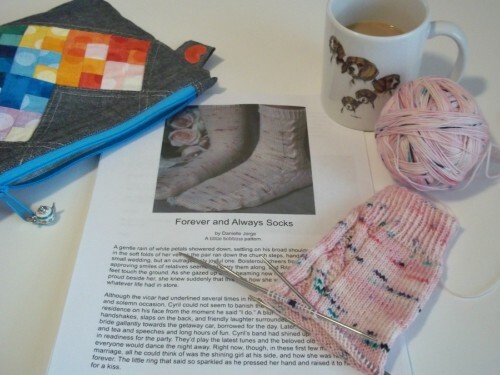 Since I am on the topic of sock knitting, (then again when am I not talking about socks), Knotions just launched an issue that is all about socks. You guys, I know I mention Knotions a lot, but it is such an invaluable resource for patterns and tutorials. The sock issue has 13 patterns and each one of them is free. Seriously that is a whole lot of talent for free. 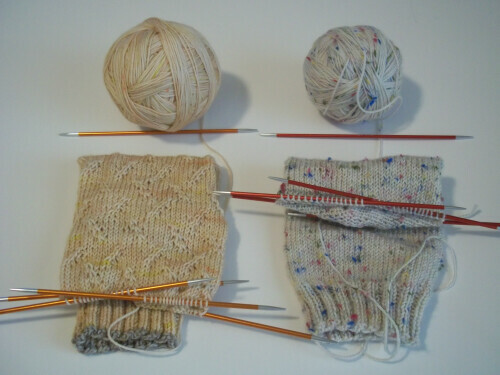 Bonus, I got the privilege of sample knitting 2 of the 13 pairs. Friday I had one of those mail days that knocks your socks off (heh- see always talking about socks)! My dearest friend Jeannine had offered to send me a few samples of yarn that she started dyeing. 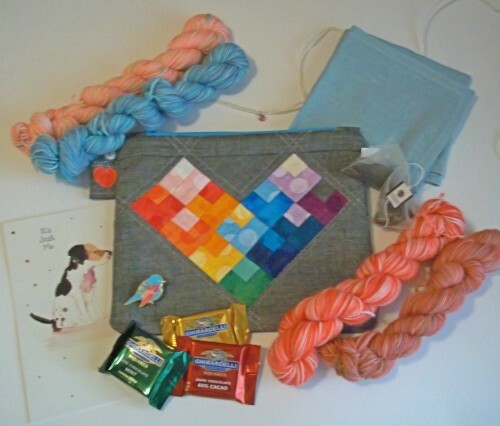 In addition to the gorgeous yarn she dyed, all the wonderful things arrived. I cannot get over every lovely thing. 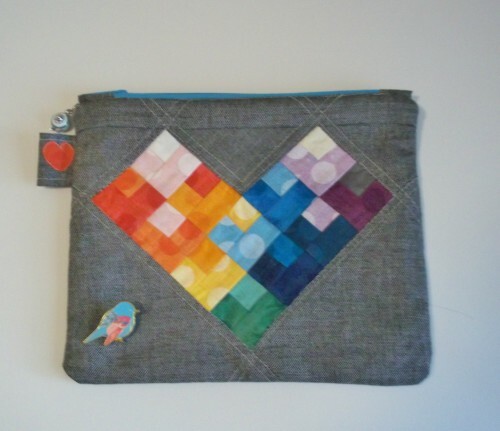 Here is a closer look at the amazing project she sewed for me. It is the most perfect bag and stole my heart instantly. 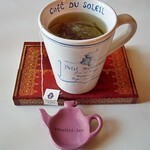 What you can't see is the lovely zipper pull progress keeper teapot. 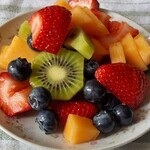 Jeannine...if you read this, your kindness has no limit. Thank you! I hope your week was a good one and you were able to fit some knitting into your days. Enjoy a song and have the best day today! Pattern~ The Coziest Memory Pattern. Happy Sunday to you, or whichever day you are reading this. :) How did your week treat you? Mine was a bit all over the place...good, but a bit here and there. Sometimes that is how life is, right? In the U.S. we have some horrific fires in our beautiful state of California this week. Above you will see that I am knitting up some mitered squares. The squares are going to be donated to a lovely knitter (lostandfawned) in our community who is going to make a cozy memory blanket for a talented dyer, Hookers Corner, who lost everything in the fires. If you would like more information on how you can help with squares, you can click on the link under Lindsey's profile. There are also a couple of dyers who are donated a portion of their sales to help HookersCorner and her family: Playful Day Yarns and Loft Twenty Two. Lastly, there is a Go Fund Me Page set up if you would like to donate. 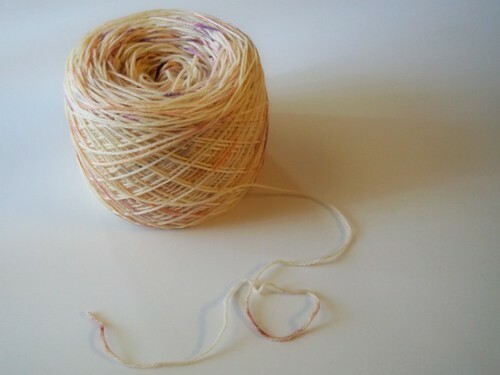 Yarn~ Cosy Posy Yarn Co Organic 3-ply in the color Emily Gilmore. Other than the mitered squares, I have frogged a sock that was started. Sometimes you have to listen to the yarn and that was the case with this yarn. 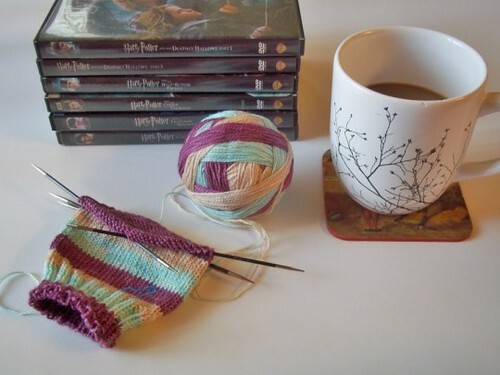 It did not want to be the previous 2 patterns I tried, it only wanted to be Hermione's Everyday Socks. Other than a vanilla pattern, Hermione's has been the pattern that I fall back on more than any other. Do you have a pattern where that is the case? Basically my week has been all about knitting, which is wonderful as it has been a while since that has been the case. How was your week? Hello there, loves! Happy Sunday. :) Thank you so much for all the well wishes. I am nearly at 100% now and could not be more grateful. While very little knitting happened, a few stitches were added to projects here and there. Most of last weekend and weeknights were spent cuddling with tea and Harry Potter marathons...which can never be bad, right? My birthday was last Saturday and while I wasn't feeling so great, I was never not grateful because it could always be worse and at least I wasn't spending my time in the hospital. :) I was able to spend some time with my family, which was a gift in itself. 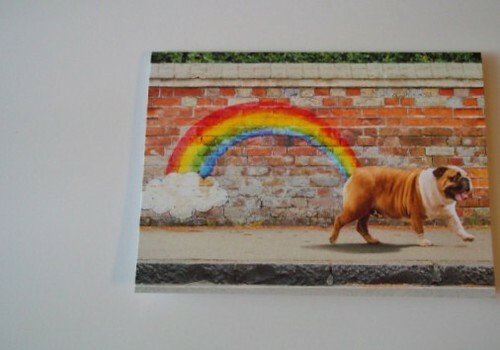 Above is my new favorite birthday card from my sister- why, because she gets my humor. Since I have nothing to show in the way of knitting, how about if I share with you this beautiful blanket my sister made for me for my birthday. It is the softest bundle of love! She also made me a pillow, but I have yet to get a good photo of it so I will share it with you next week. Congratulations, Floribunda! I will be emailing you shortly to get your mailing details. 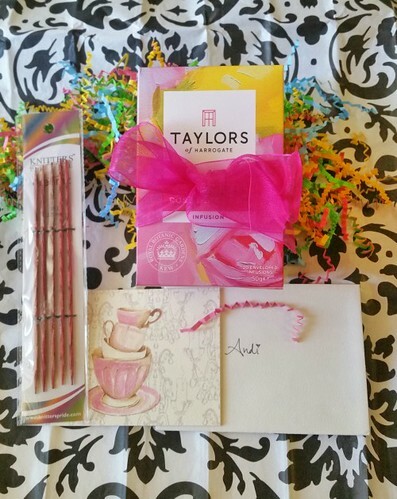 Thank you- Wooly Wonka Fibers for the beautiful prize donation! Alright, loves time to leave you with a song and wish you the best day. Hello, there. How was your week? 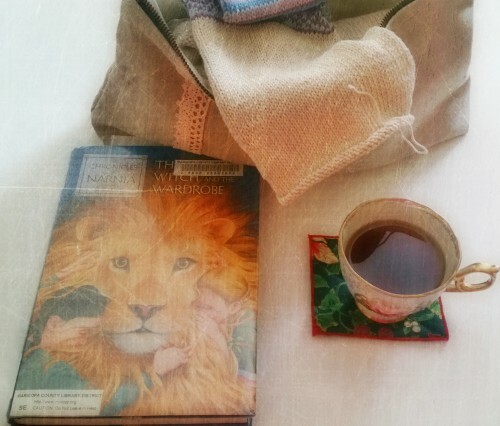 My week was filled with great work days and ample knitting time, which makes for an ideal week in my book. We have been having our usual Monsoon storms here, but as I was discussing with friends and family, the storms feel stronger and more frequent than the years prior. Are you noticing that your Summer storms have increased this year? 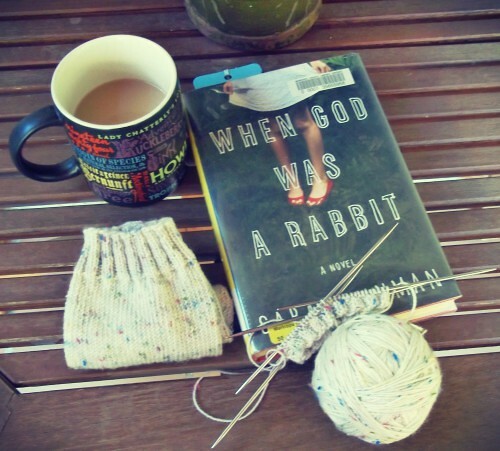 Enough talk about weather, let's chat about knitting. There is something I have been thinking about for a little while now. It is a topic that comes up from time to time in comments here and on Raverly. I noticed that some yarnies making comments about what it means to be a "real knitter". 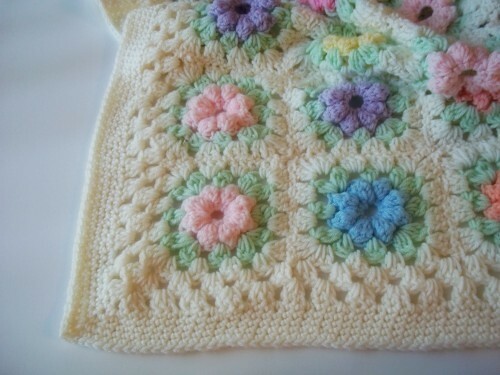 I have heard comments like, " I wish I could knit [this] or [that] type of project, but I only knit washcloths. Or maybe certain techniques like colorwork or brioche, hold them back from feeling like they are "real knitters". 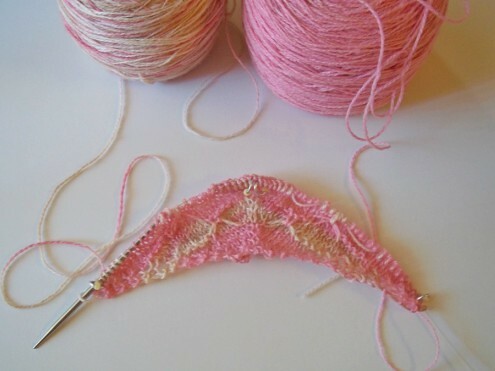 I have even heard people downplay their projects because of the yarn they use, for example if they knit something out of acrylic instead of wool or a wool-blend. At time I have even read people comparing themselves to knitters who pump out more projects, considering themselves less than because of it. Not sure where all this negative self talk came from and I am sure there are those who say that it falls upon the individual who may put themselves down in all aspects of their lives, not just knitting. Maybe it comes from all the stunning and sometimes stages photos from Instagram or there about making them feel "less than" about their own knitting? All I know is that knitting should bring us pleasure. We spend our days at work or in other areas of our lives being compared and accessed by our abilities, looks and productivity...let's take the time to not only say something nice to others, but to ourselves. Please enjoy a sing and have the best day today! Hello and happy Sunday, loves! How have you been since we last talked? 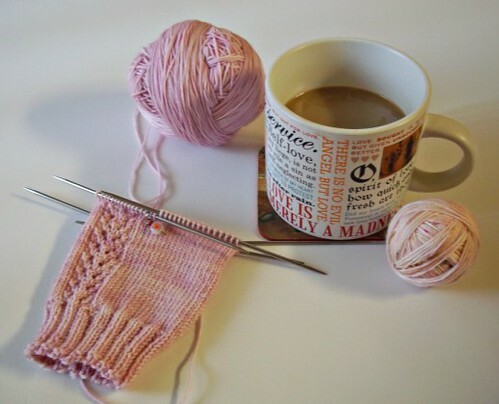 This morning finds me knitting on my Let it Shine socks with a nice cup of coffee along with very grey skies. Bliss, I tell you. Can everyday please be like this Sunday? 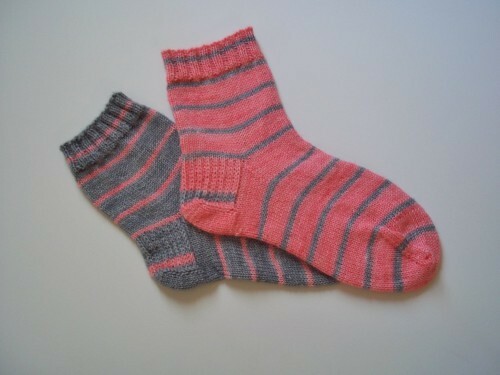 I finished some secret sample/test knit socks for Knotions magazine. Explains why they are folded in such a way, right? 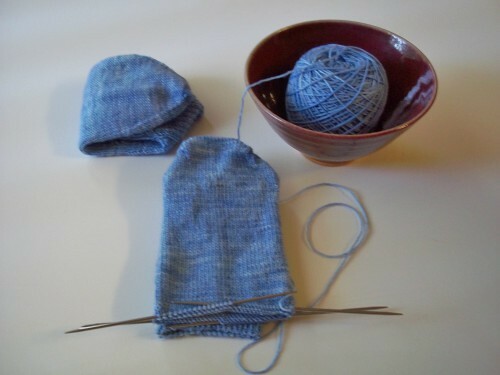 Bonus, I have yarn coming in the mail for another pair of sample/test knits socks coming soon. Whoo hoo! A wee bit of progress on my KAL shawl happened this week. 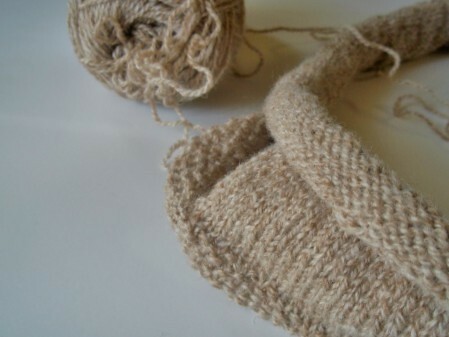 Plans are to get in a few more rows today then to switch gears and work on the sample knit cardigan (pic below). So many things on the needles! Overall, a very knitty week, just how I like it. There are those blogs where the stunning photos draw you in and the stories keep you coming back for more. Jean's is on of those blogs. Love her most recent posts on what is Yarnscape. 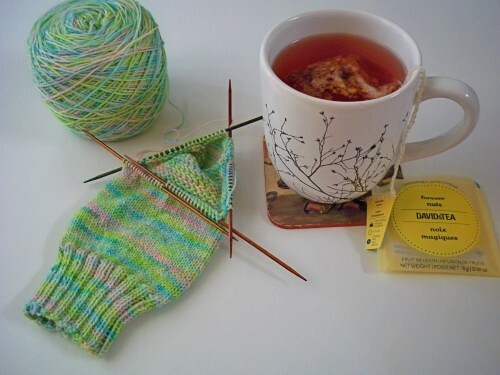 Attending a knitting retreat is a long time dream of mine. Andrea shares a retreat she attended in my favorite state Colorado and I am in love. Over the last couple of weeks a few knitty friends of mine on Raverly have shared they are suffering from pain when knitting. 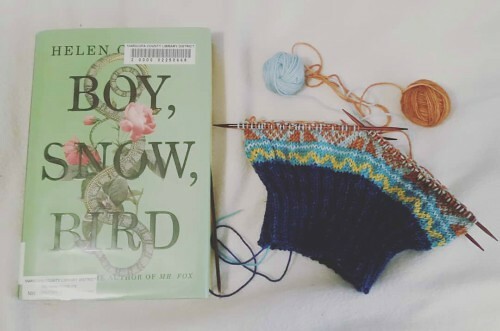 Not being able to knit strikes at the heart of every knitter, so it was interesting when I read this article by Chloe Benjamin. 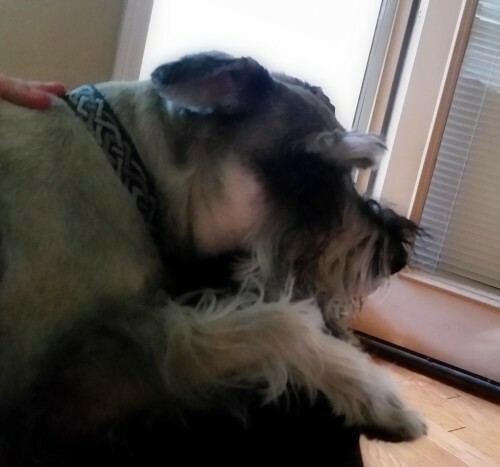 Love this post from Shannon about how she is going to slow down her Summer. Sometimes we all need to step back and reprioritize our lives. I am adoring Leslie's What the Fade progress and those tassels equal insta-love. 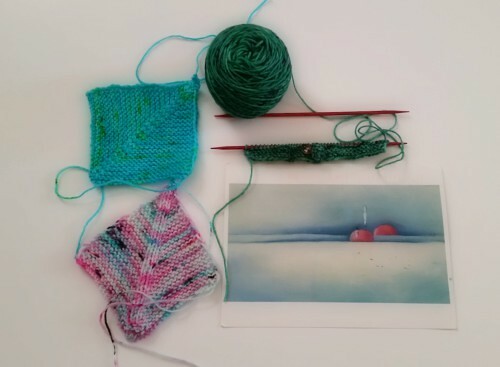 Enjoy doesn't even begin to cover how brilliant is has been to read through Helena's post about on the Jyväskylä Knit Festival 2018. It is always a "Merry Meet" whenever I visit Fin Folk and Oak and there are times I never want to leave. I will never get enough of Autumn Geisha's progress pics, especially as they are primarily socks. Tien is my sock and yarn muse. Alright, I will stop monopolizing your time and ask that you enjoy a song. Happy Sunday! With all these summer storms in the U.S., I hope everyone is safe and happily knitting away. Knitting is happening here, it is hot but that is not keeping me from knitting all the things. If anything I am having to hold myself from casting everything. Case in point, I finished these loves earlier in the week and for some reason I kept telling myself that I deserved to cast on 3 more socks as a treat since I had an FO. Thankfully my brain took over and reminded me that I already have a million things on the needles. 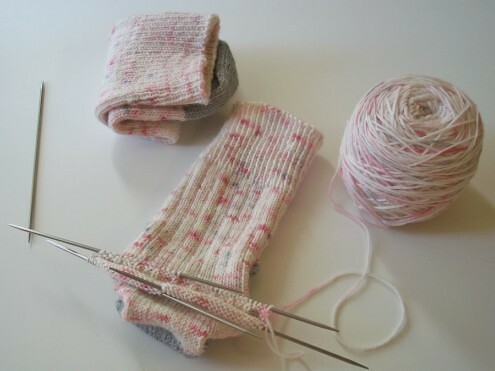 These socks were so wonderful to knit. Yes, they are just plain vanilla socks, but those colors and stripes kept me going at full steam. Quick note about the yarn, this pair is my 6th finished pair of socks that I have knit out of Spinning Fates Yarn. I have 2 more skeins in my stash that I am hoarding but would really like to cast on. 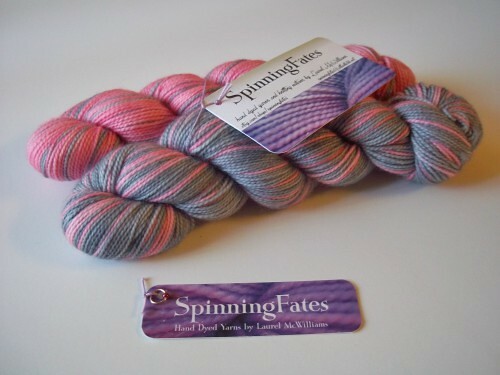 Spinning Fates was one of my earliest Indie dyers and obviously the love affair has never ended,(I am eyeing her colorway, Purple Reign big time). 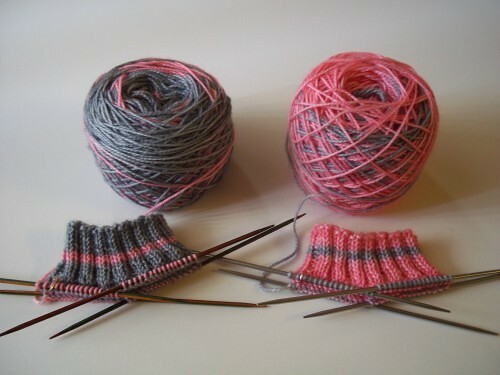 Pattern~ Emily's Favourite Socks Yarn~ Circus Handmade in the color Galah. Progress on my Emily's socks is still happening. I think if I keep with it, these will be done fairly soon. Excuse the dark lighting, sometimes Monsoon weather darkens things up a bit. But if you know me, the greyer the better when it comes to skies. Happy Sunday! Did your week treat you well? 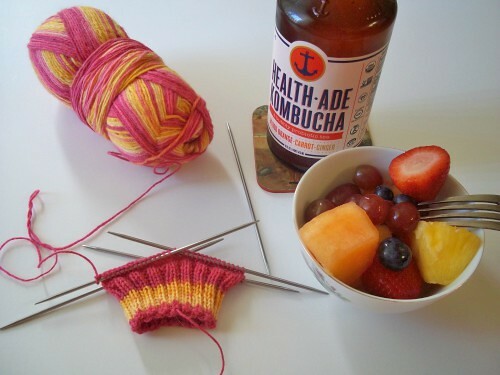 Were you able to squeeze in some knitting time? My week was good and yes, that is primarily because knitting time was made. I was a bit all over the place with my knitting, a row here and a row there. 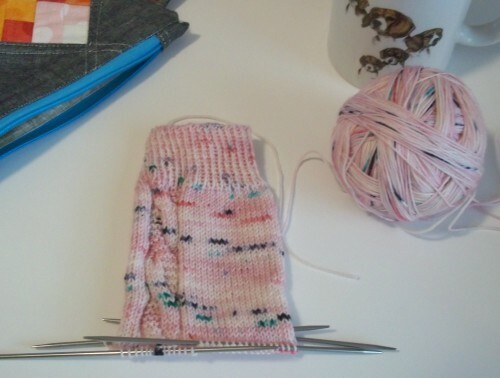 Progress on my Cadence socks is coming along. There is something about this pattern that makes it seem that it knits itself. 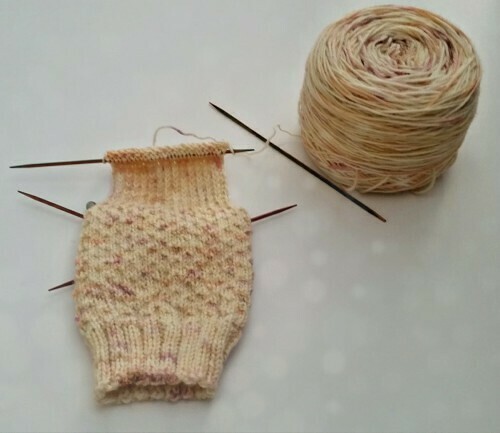 The original plan (if you could call it that), was that I was going to finish up the Cadence socks and work on the sample knits. Then the postman arrived and all plans went out the window. A lovely friend sent me a surprise gift from one of my favorite dyers, Spinning Fates. Pink and grey...they were begging to be cast on. The color is Lady Meux. I took some advice from the recent post about Second Sock Syndrome and decided to knit these babies in unison. It is working and I think the fact that they are fraternal twins makes it all the more exciting. On a totally different note, I had to share Carl with you all. 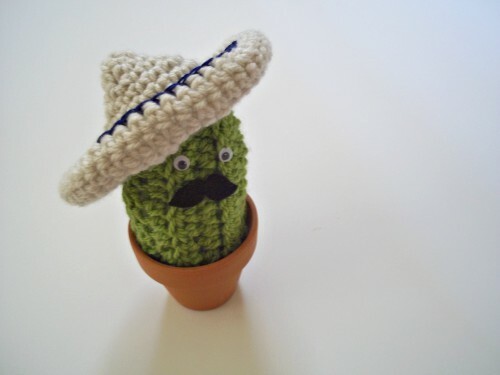 My sister crocheted me this little cutie and he is everything! I mean how could you not look at that face and smile? Now, I have a treat for you all. 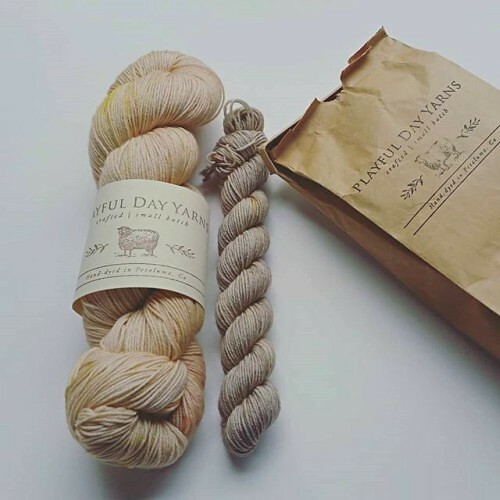 One of my dear friends and very talented dyer, Vanessa of Dyed in the Wool Yarn Co. surprised me by asking if she could send me some yarn and she would include a skein for a giveaway. Since I secretly wish I were Yarn Santa and able to gift all the yarn, I said yes! 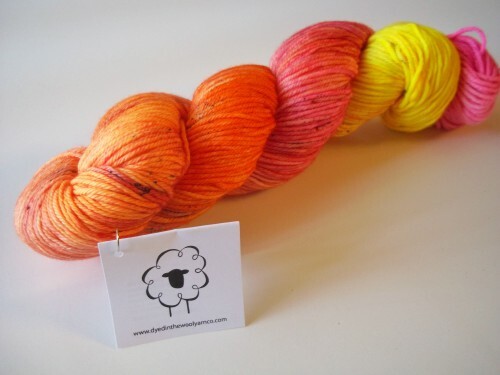 this gorgeous skein will go home to one lucky winner. 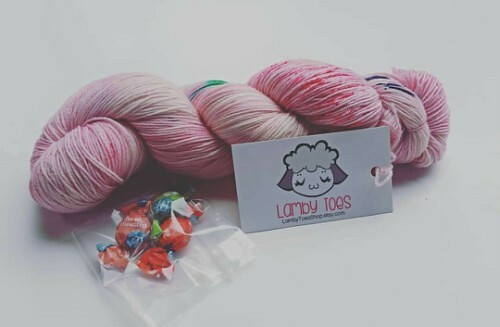 To win tell me what you would like to knit with the gorgeous skein (you know my mind went to squishy DK socks), in the comments. Make sure to provide your email address when it prompts you. Giveaway is open world wide and will close on July 31th at midnight. 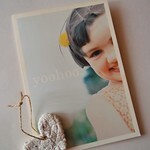 The winner will be announced on August 5th's blog post. Thank you for all who entered! This giveaway has now closed. I will leave you with a song and wish you the best day today!